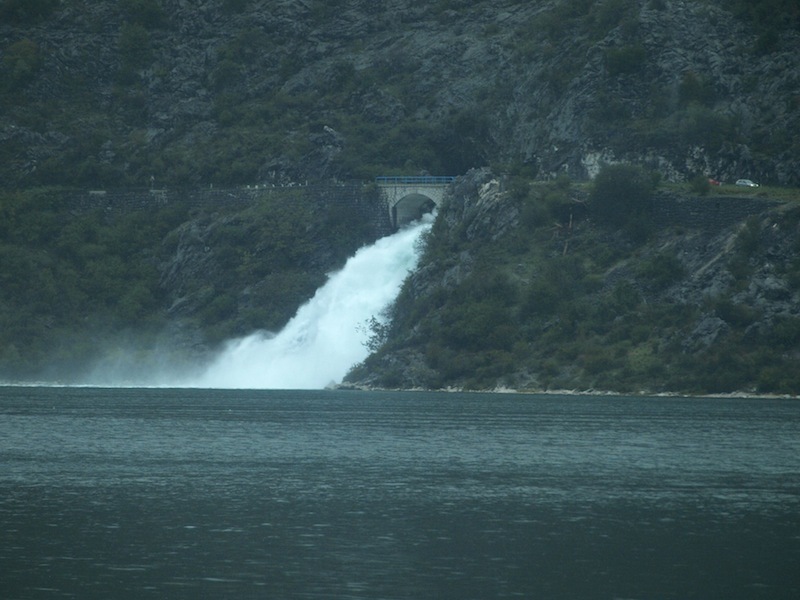 Some people think the Bay of Kotor is a fiord but in actual fact it is a ria. 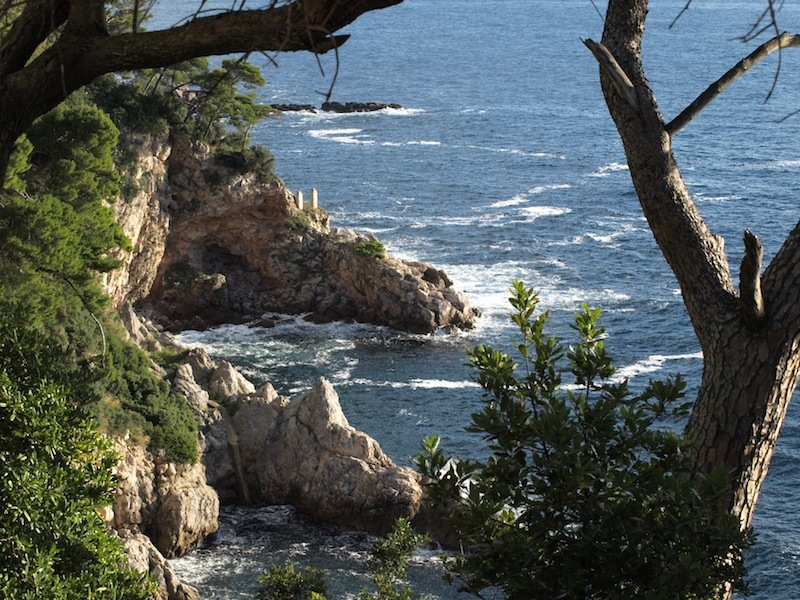 A ria is a coastal inlet formed by the partial submergence of an unglaciated river valley that remains open to the sea. Typically, rias have a treelike outline although they can be straight and without significant branches. There were thunderstorms through the night and it is still raining this morning. Rivers and creeks are running a banker, not the best day to be on the road but just the same we have to move on as we have been in Perast for four nights. 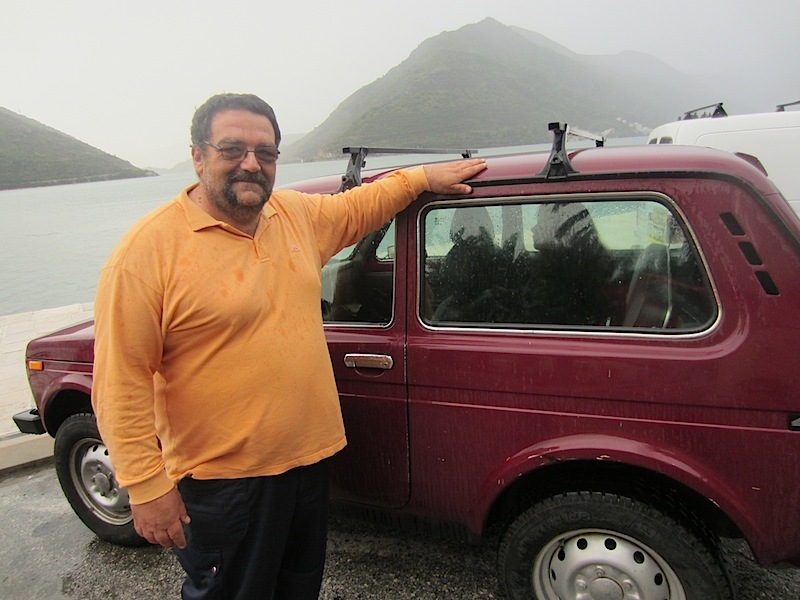 Cico the fireman gave us a lift to the bus stop in his Lada Niva, a Russian 4WD. I drove one once and other than the unbelievably heavy steering it was a good knockabout vehicle. I asked Cico how much one costs and he said a good second hand one with power steering would be 4000 euros (A$5000). One of these vehicles would be ideal to tour the less developed countries of Europe, as they are tough, have large diameter wheels and getting one serviced would present no problems. They are also economical. A Lada Niva would also be an ideal vehicle to drive from Vladivostok (East Russia) to Moscow through Mongolia and Siberia. This trip is not on my bucket list but I wouldn’t mind adding it! Any takers? Cico the fireman, with his pride and joy. Today was a bus day. 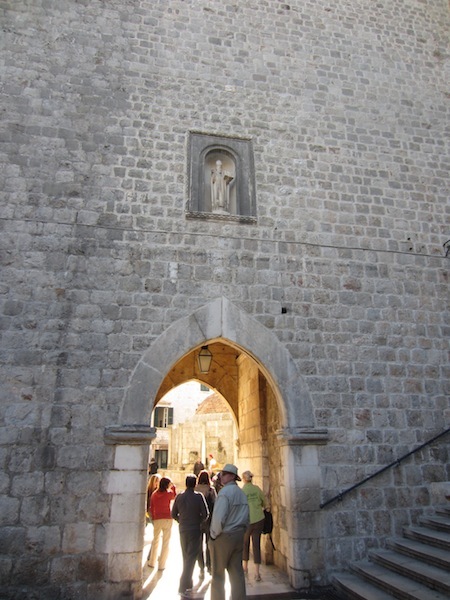 The first bus, a small one from Perast to Kotor, was a real sardine experience (fifty five people packed in). The next bus was a larger one and took us from Kotor to Dubrovnik. 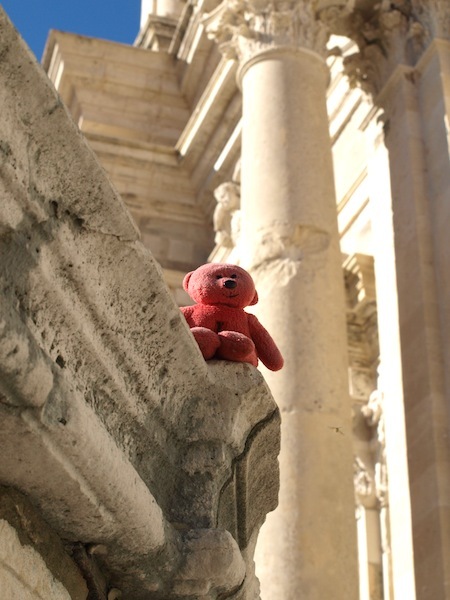 At Dubrovnik we intended to take a third bus to Mostar. 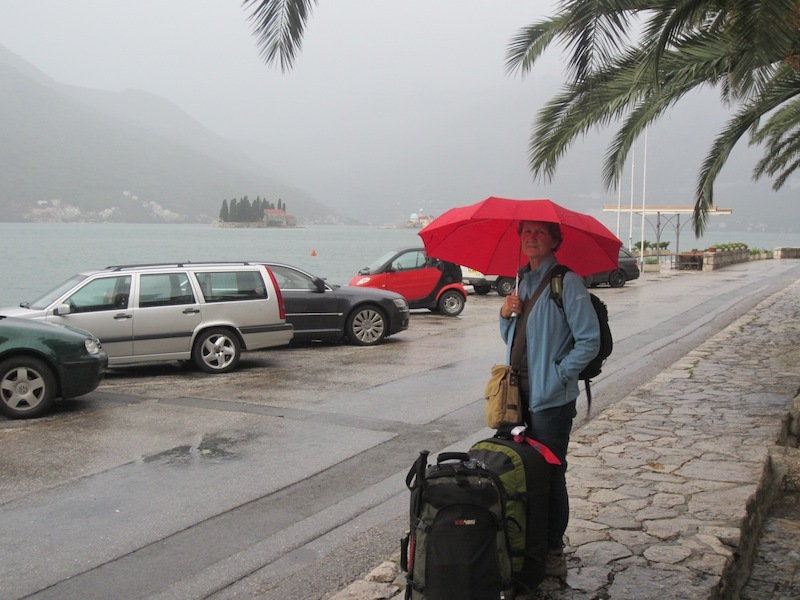 The road from Kotor to Dubrovnik followed the foreshore of the Bay of Kotor past Perast to Herzeg Novi. This town is located near where the Bay of Kotor joins the Adriatic Sea. 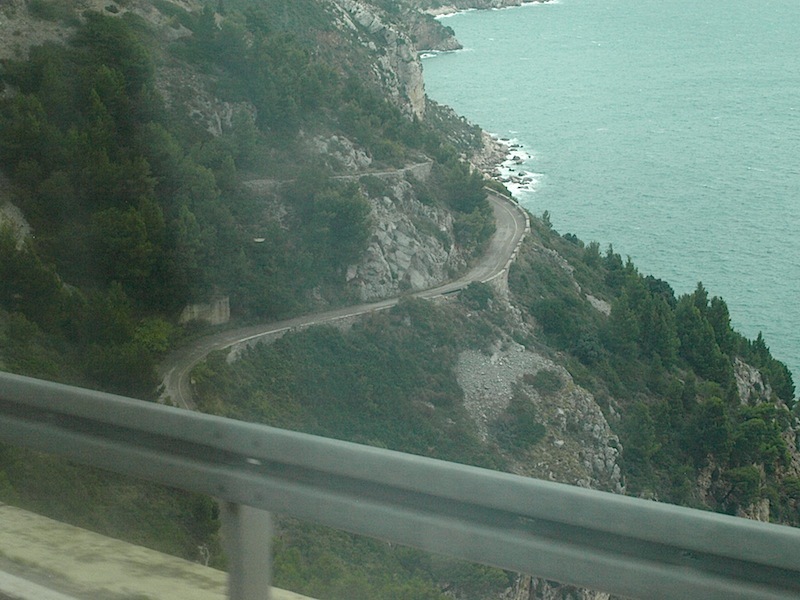 From Herceg Novi the road heads north to Dubrovnik, following the coast and even though the windows of the bus were fogged over I managed a couple of photographs. A river flowing into the Bay of Kotor. One day during our 1972 journey we drove through fog all day and when it came to making camp we pulled into a small layby and slept in the car. We could hear water thundering and I remember saying to Bev that it was best not to wander too far from the car as we could be camped on the edge of a waterfall. I think our camp may have been at a similar spot to the one in the photograph. When we left next morning it was still foggy so we never knew where we were camped that night. I have always wondered. 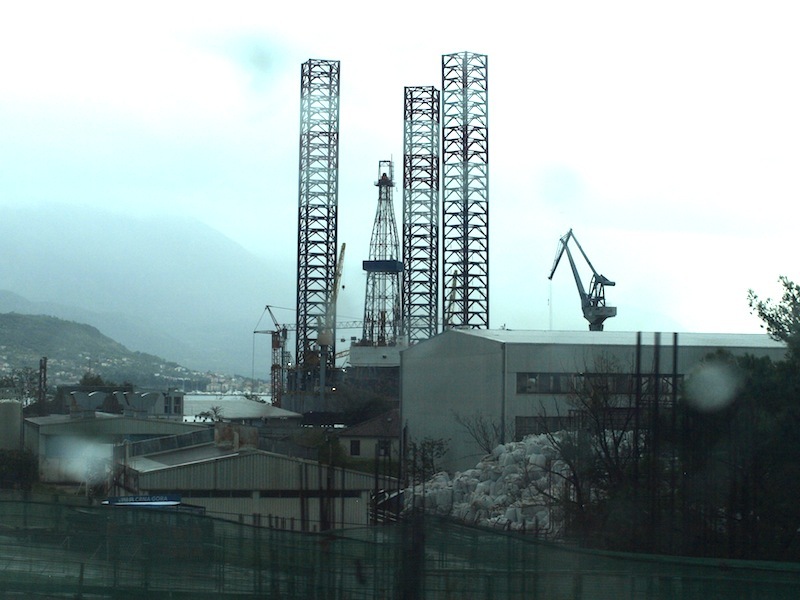 An offshore oil-drilling platform under construction in a shipbuilding yard on the edge of the Bay of Kotor. 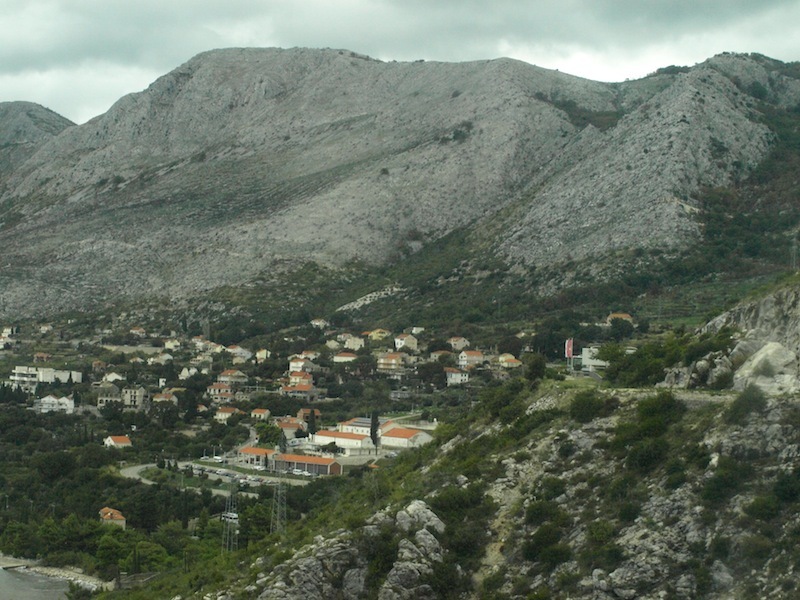 One of the many villages between Kotor and Dubrovnik. The limestone mountain towering over the village was mostly scree. Below the current highway is the old road we drove in 1972. Arrived at Dubrovnik bus station mid morning. Last night we decided not to overnight in Dubrovnik as we explored it in 1972 and a historic place like Dubrovnik wouldn’t have changed much. 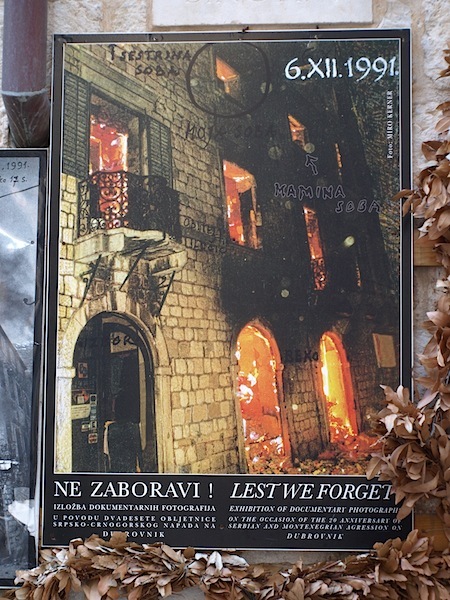 Then I thought about the bombardment of Dubrovnik by Serbian forces during the break up of Yugoslavia in 1991 and decided it might be interesting to see the effects of this attack. As has been the case in our travels so far, the first thing to do upon arrival is to find suitable accommodation. It seemed today it was going to be a bit of a challenge as it was raining and the bus station was located well out of the town. Fortunately we were approached by Slavko, a local who offered us a studio for twenty euros per night. From what I can work out, a studio is an apartment with a kitchen. He bundled us into his car and took us to the lodgings. 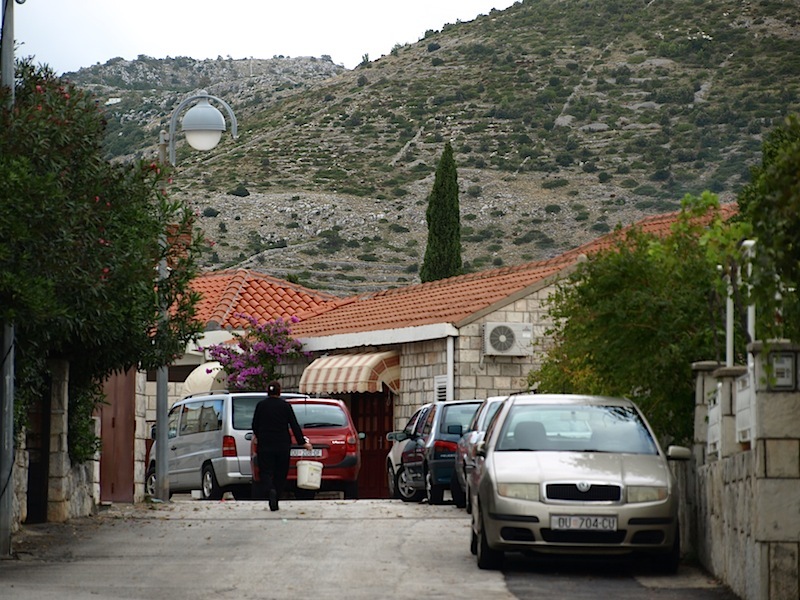 The studio is about four kilometres from the old town of Dubrovnik, which suited us fine. Our Dubrovnik studio entrance is in front of the red car. 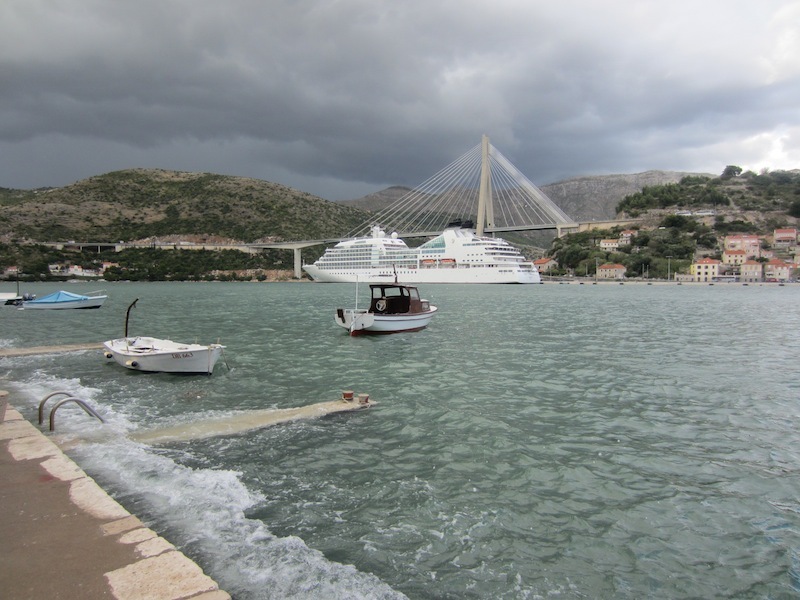 Because the weather was so lousy we decided not to go into Dubrovnik this afternoon but go in tomorrow. So we went to the local supermarket to buy not only food but to get another umbrella as we left the two we bought in Istanbul on the bus this morning. On the way to the supermarket we experienced a near miss with a bolt of lightning. A near miss is when you hear the bang and see the flash at the same time. A little shaken we headed back to the studio and didn’t venture out until late afternoon when we walked along the waterfront just below the apartment. It was an interesting walk as the tide was in and waves were lapping the foundations of some waterside homes. At one time we took shelter in a boat shed to avoid the rain but the owner came and indicated we should move on as he wanted to close the door. Croatians are not really that friendly. 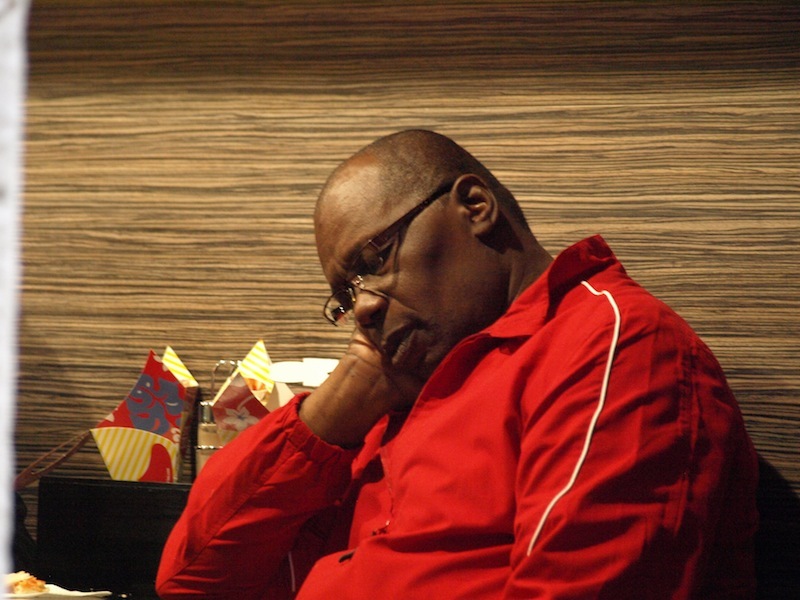 They are either ‘touristed’ out, or have other pressing matters on their minds and are oblivious to others around them. 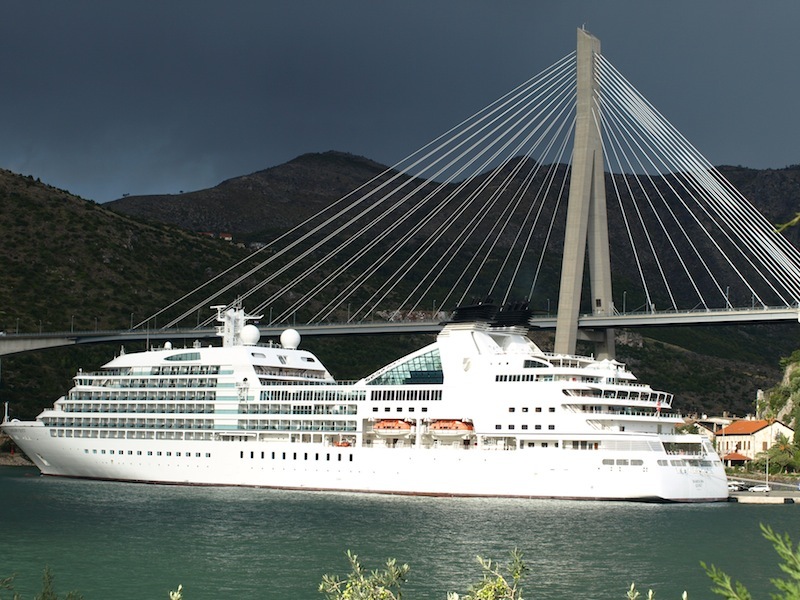 One of the many cruise liners that come to Dubrovnik. Moored on the opposite side of the bay where we walked this afternoon were three cruise liners. 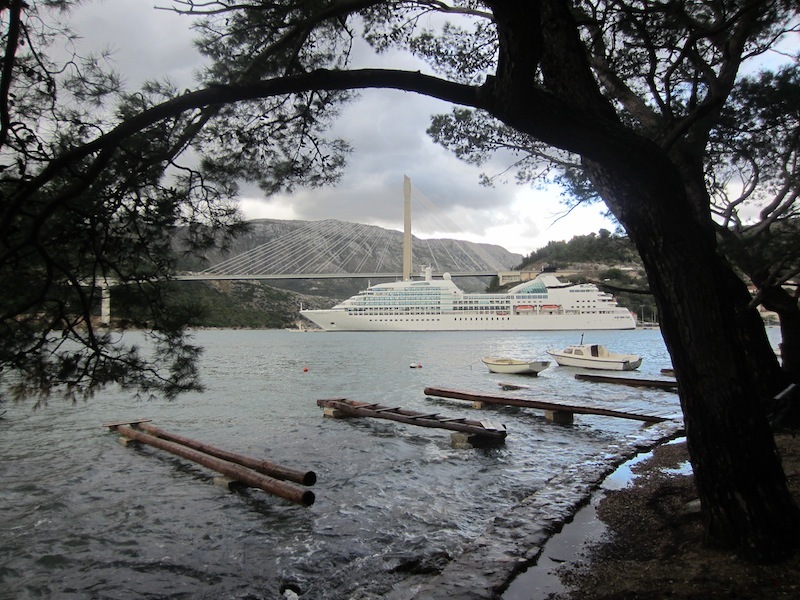 When one arrives, dozens of coaches sidle up to the gangplanks and take passengers into the old walled city of Dubrovnik for the day. At the end of the day the passengers are taken back to the luxury of the liners and the ship steams on to the next port overnight. Cruising on such ships might have advantages, especially for those not experienced with ways of world travel, but it wouldn’t suit us as we like to have more control over our own destiny and be out there finding the unusual. The bridge in the background is the Franjo Tudman Bridge and was named after the first president of independent Croatia. Construction of the bridge began in 1998 and was officially opened in 2002. The bridge construction costs were reportedly US$31 million, making it the most expensive bridge in Croatia. 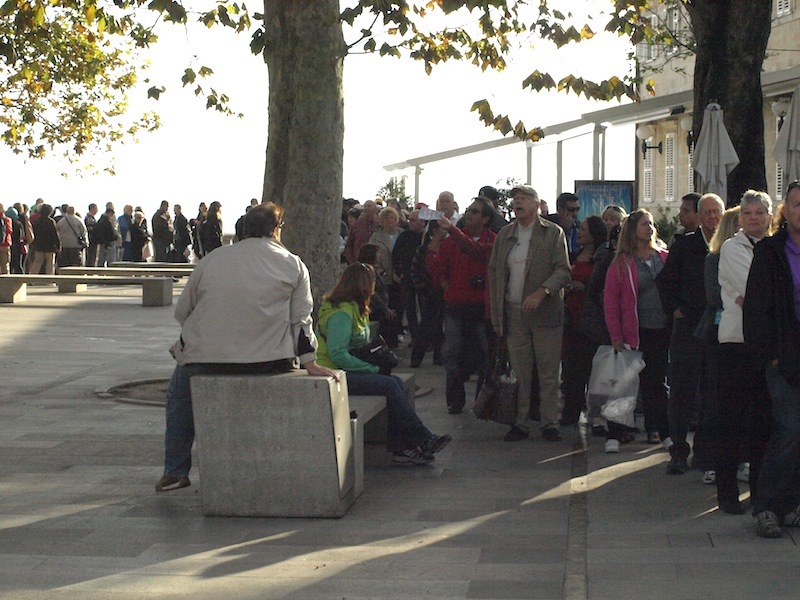 Cruise ship passengers at the end of the day in Dubrovnik waiting to board coaches to be taken back to their floating hotel. Following are a couple of waterfront images just below our apartment. Once the waves break over the stone pavement here seawater goes into the lower floors of people’s houses. The parallel logs are small jetties. Baffle boards to stop water running up the launching ramp into the lower floor of a resident’s house. For most people, rising sea levels are of little concern but for those living on an island only a metre above sea level or for those with houses along the Mediterranean built at sea level it is more than a worry. 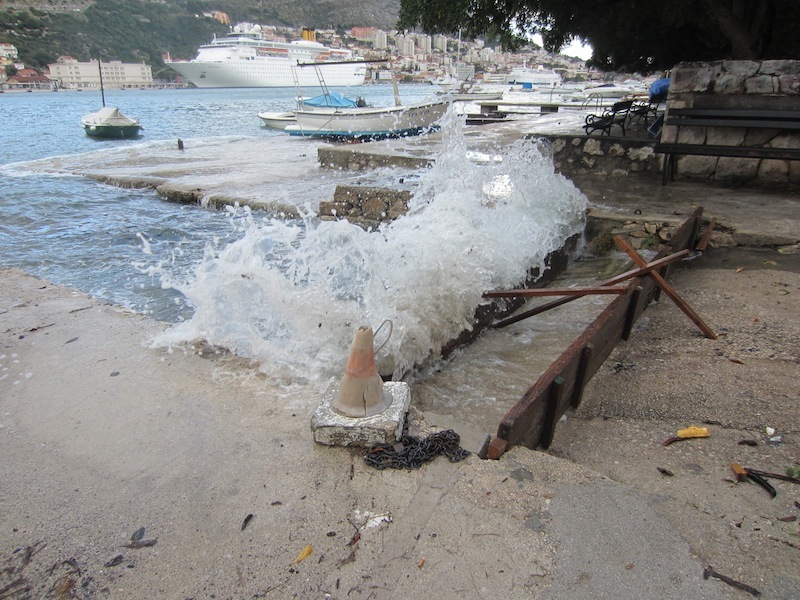 Tomorrow we are looking forward to improved weather conditions, which will make the visit to old Dubrovnik town enjoyable. There is nothing better than sitting in the sun with a warm stone wall at one’s back. Because Bev and I have not experienced a winter for more than four years we are feeling the cold. Thermal tops went on even though it was 14 degrees. This morning we had a bad bus experience. I took a seat in the bus whilst Bev proceeded to pay the driver, but unfortunately she was a few coins short (she had a large denomination note but the driver had no change). The driver turned to me and in a loud gruff voice said ‘Off’! We did as he said, with some very loud comments about the inhospitable attitude, and walked to the next bus stop (only about 300m away) where the change Bev had more than covered our fares. I thought as an act of friendliness to foreigners he would have given us portion of one section free. 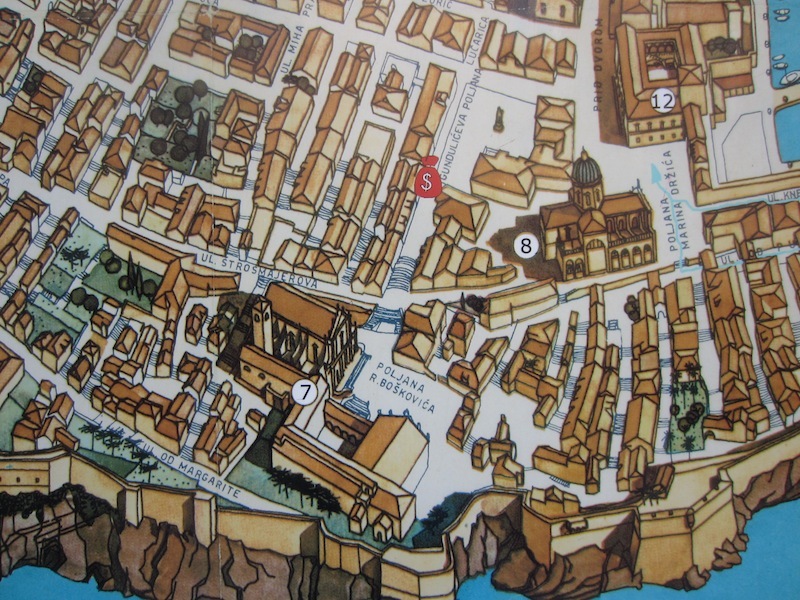 The walled city of Dubrovnik. 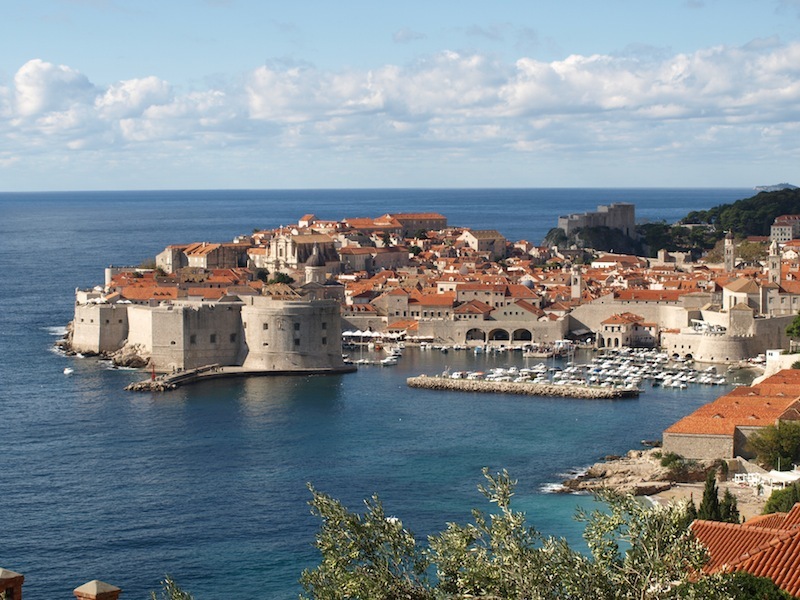 Historical lore indicates that Dubrovnik was founded in the 7th century on a rocky island named Laus. It is thought the island provided shelter for refugees from the nearby city of Epidaurum (a 6th century Greek colony). Recent archaeological excavations however indicate that the Byzantines may have had a basilica in the area as well. We may never know who came first, all we know is we are here and it’s a bright sunny morning. Dubrovnik has changed little since we were first here in 1972. The only changes are more shops geared to selling stuff to more tourists and, of course, more cafes and restaurants. Ignoring the tourists, and the activities associated with tourists, the city still has a magic charm and it is hard to understand how Serbian forces would even consider trying to destroy such a beautiful city. The old town of Dubrovnik. The General on trial was found guilty by the International Criminal Tribunal of the former Yugoslavia (ICTY) and he was sentenced to eight years jail for his part in the shelling of the city. Below is a collage showing Dubrovnik under siege. From Wikimedia Commons courtesy of Peter Denton from Teddington, UK. 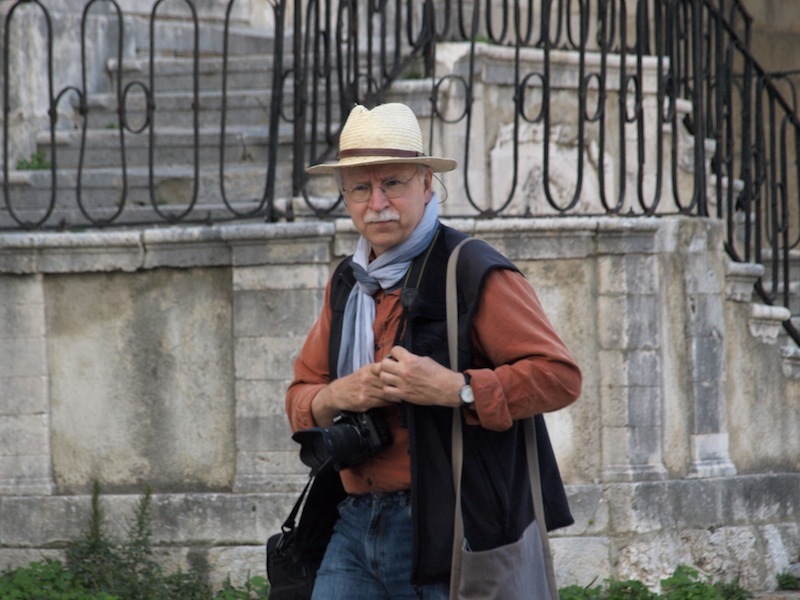 Peter is a retired editor writer. Clockwise from the top. Malyutka wire-guided missiles in a Serbian placement overlooking Dubrovnik; typical street scene during the war; people queue for water at a standpipe; JNA soldiers checking papers at the coast. (JNA is the abbreviation for Jugoslavian National Army). A malyutka wire-guided missile is a Russian-made radio-controlled missile. The reference to wire relates to fine wires trailing from behind the missile, which receive signals from the ground station. A map showing direct hits and burnt buildings. The black triangles mark direct hits and the red boxes mark buildings totally destroyed by fire. 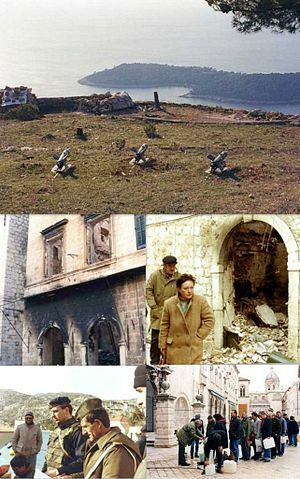 The siege of Dubrovnik was part of a plan by Slobodan Milosevic (leader of the Socialist Party of Yugoslavia) to remove by force the non-Serbian population from Dubrovnik and to detach the Dubrovnik area from Croatia and annex it into Montenegro. 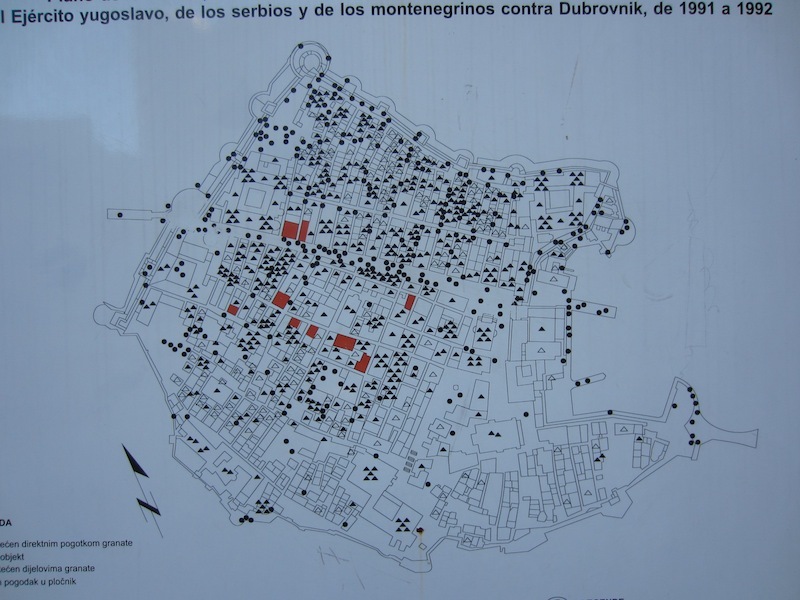 During the shelling campaign conducted from high ground east and north of Dubrovnik forty-three Croat civilians were killed and numerous others wounded. Trying to understand exactly what happened in the 1990s war is beyond my comprehension. All I can say is the tensions between the warring parties did not simply happen overnight but were a result of thousands of years of power struggle and hatred. 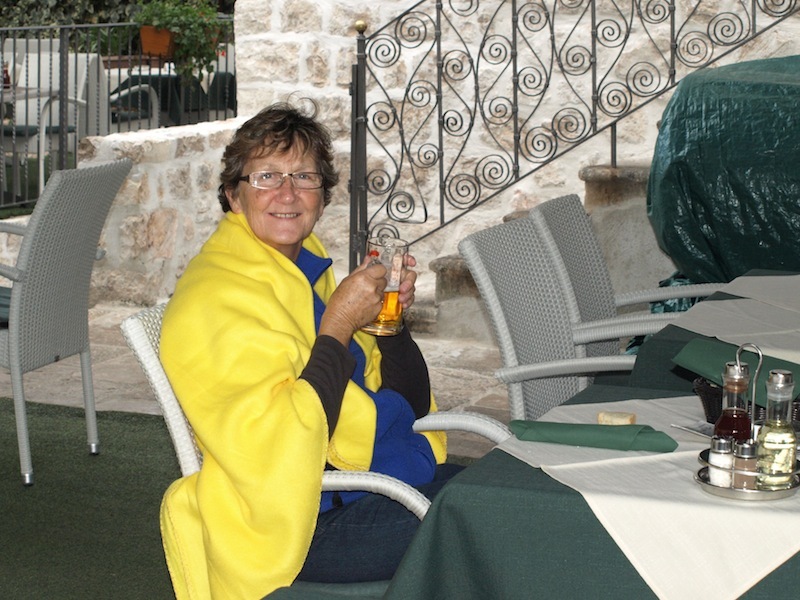 By the time Bev and I have visited Mostar and Sarejevo I might have a better understanding. 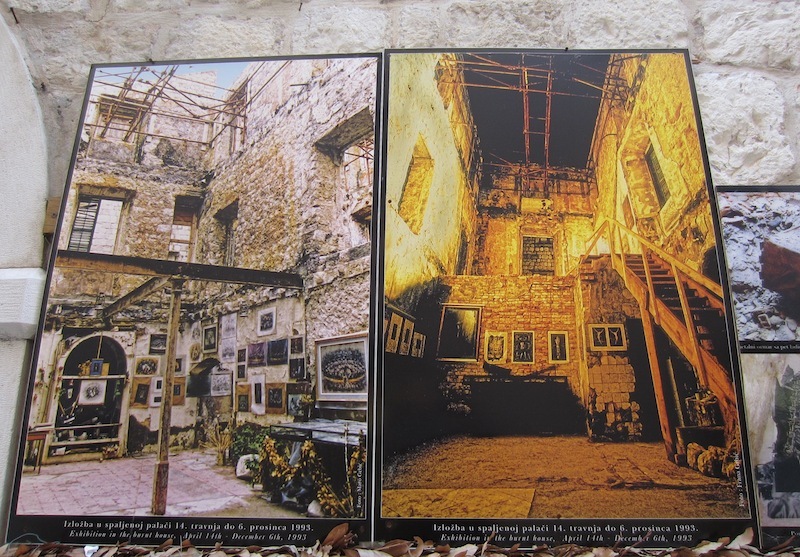 In Dubrovnik today there is very little photographic evidence showing the destruction caused by the bombing. All I found was one set of posters outside the post office. Framed photograph on a wall near the post office. This balcony took a direct hit. This image shows the same balcony as that in the above two photographs plus the adjacent building burning. 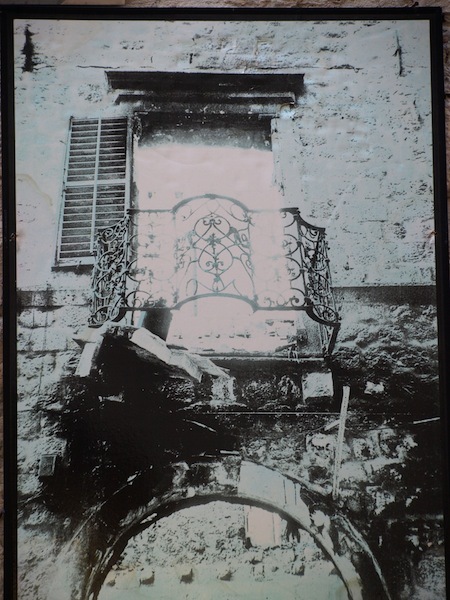 Poster showing the restoration phase after a direct hit. 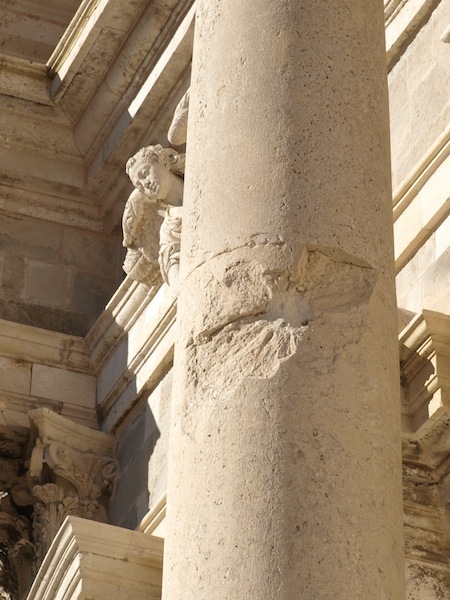 Shrapnel damage to one of four columns of the St Ignatius Church. A repaired section of wall. I guess the unobservant probably wouldn’t see it. 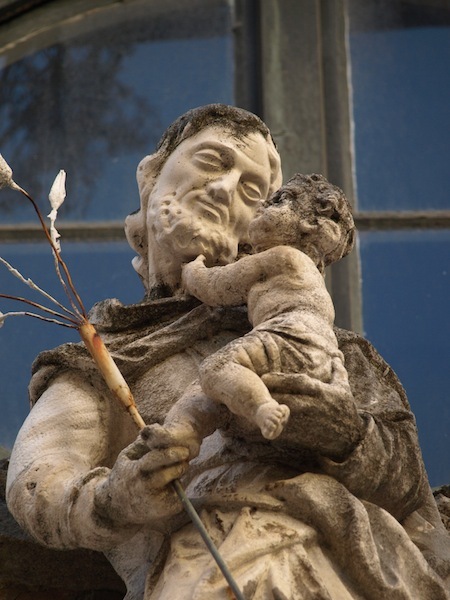 After the restorations and reparations I expect it was a matter of accepting that ‘life goes on’. I have to say though I didn’t find the service providers in Dubrovnik terribly unhelpful (like the bus driver this morning). I was reprimanded for standing at a museum door and looking in without paying (I didn’t see the attendant who was on a mobile phone with her back to me) and if you stepped aside to let someone past in a narrow alleyway or footpath not one person acknowledged the fact. Where have good manners gone? 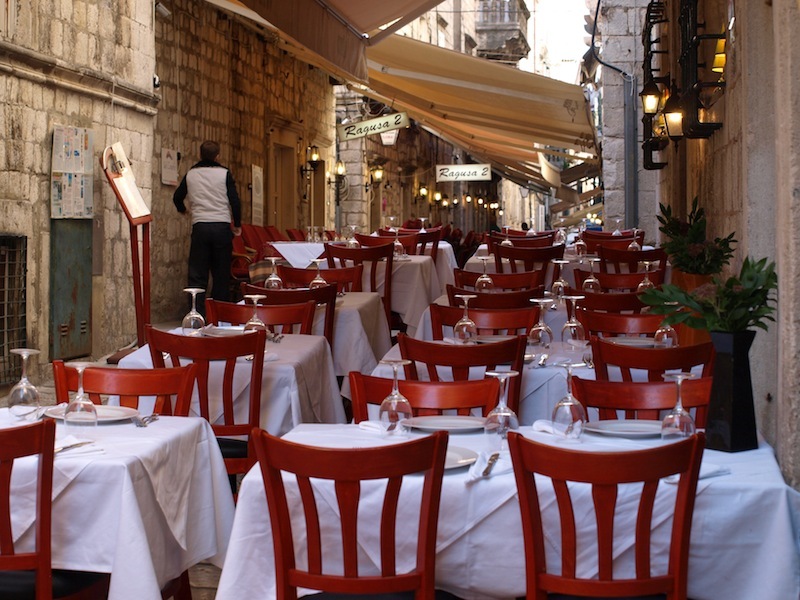 A restaurant in an alleyway. 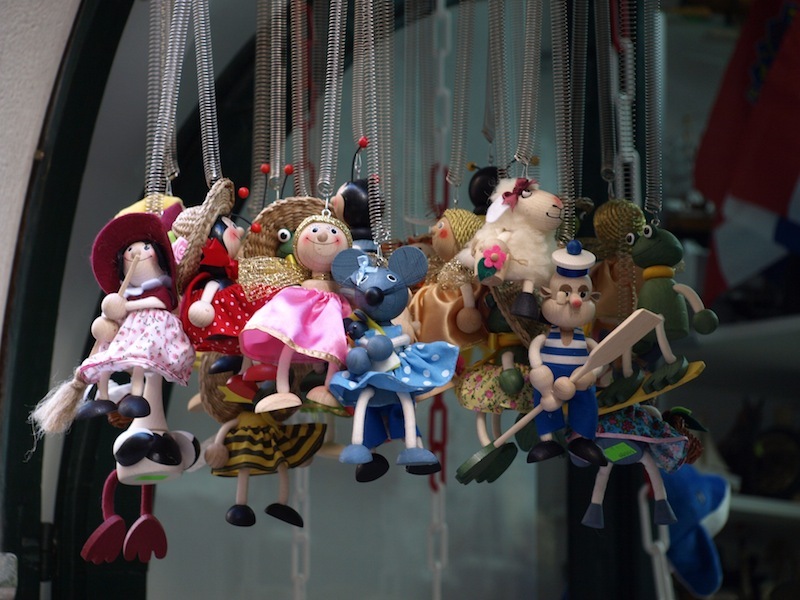 Some of the goods on sale are well made and creative. 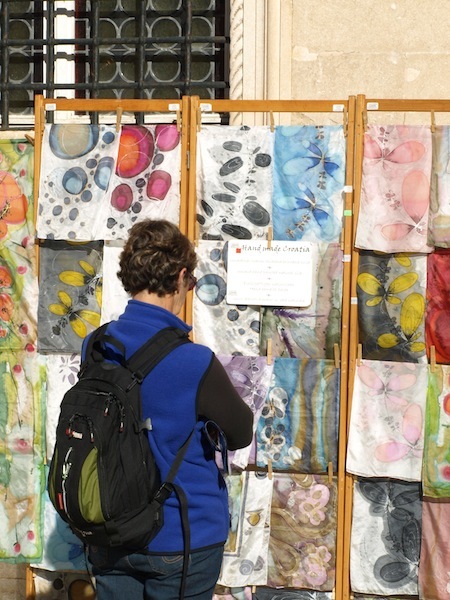 These tie-dyed silk scarves are an example. 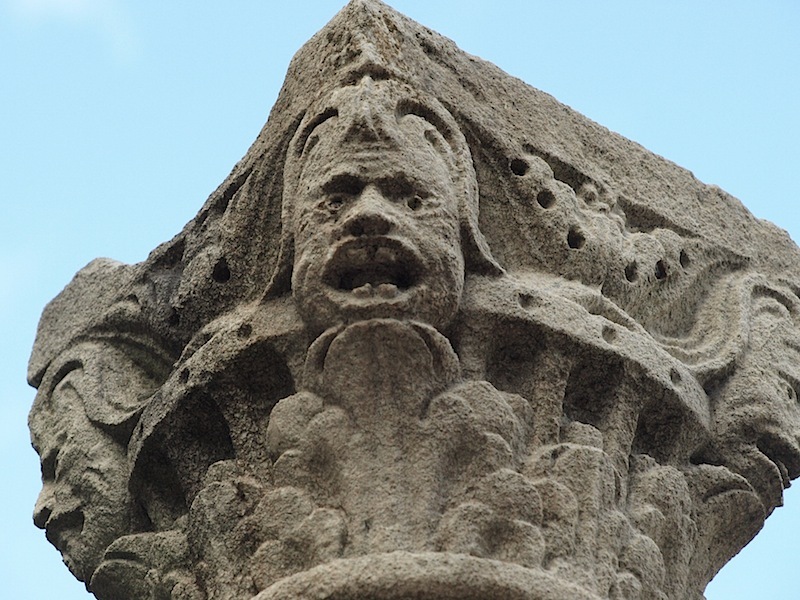 As I walk around places like Dubrovnik I look up, not only to see the oddities up high but to see those looking down. Following are a few examples. ‘Oh no! Not time for another nappy change!’ Look at the veins in the back of the old boy’s hands! Why are you taking a photograph of me? A little dentistry wouldn’t go astray here. T Bear up there with them too. 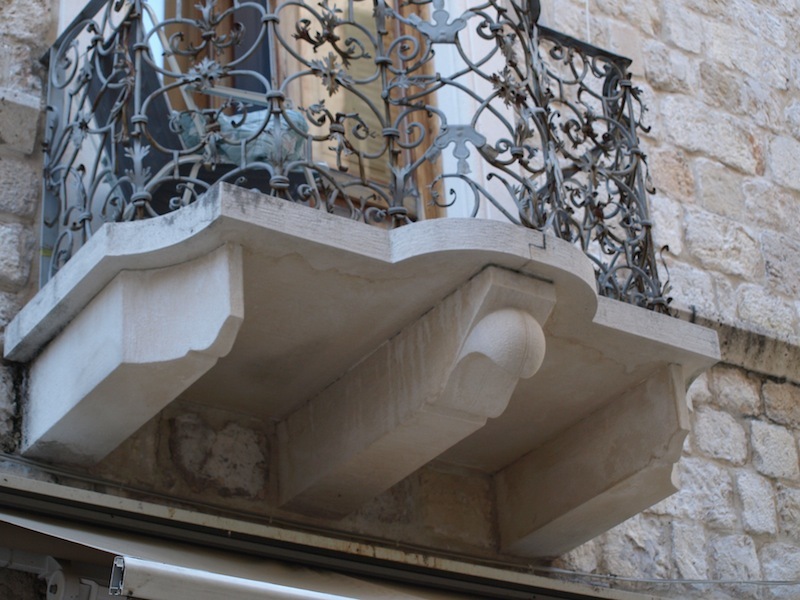 I had to include this image of a dormer window because I wanted to tell you about the origin of the word ‘dormer’. 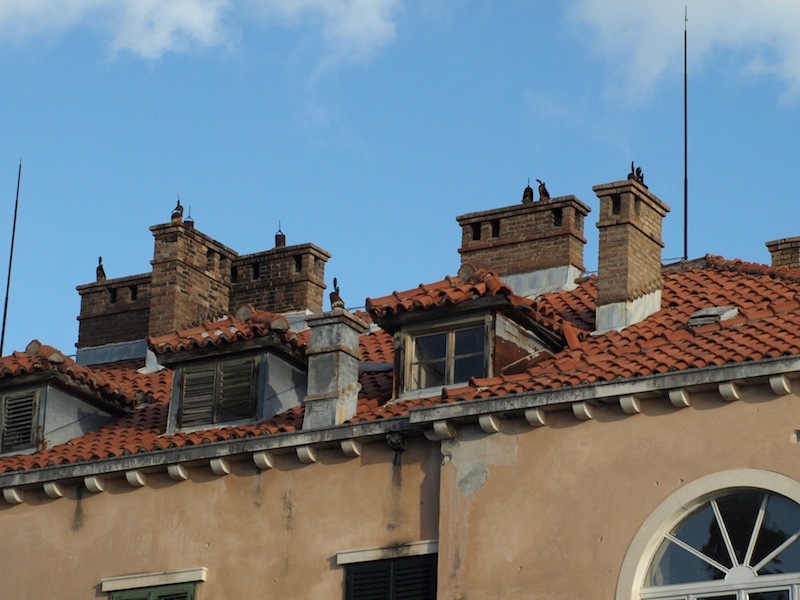 There was a period in England when accommodation was in short supply so people slept dormitory-style in the roofs of houses and because it was stuffy in the roof they extended the roof upwards and added a window. Hence the dormer window. 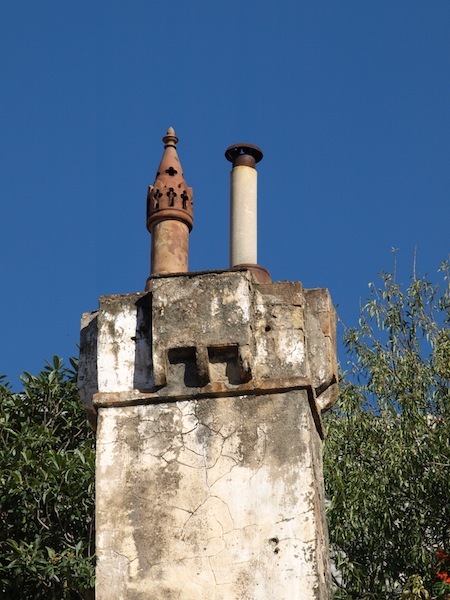 An old and new chimney pot. 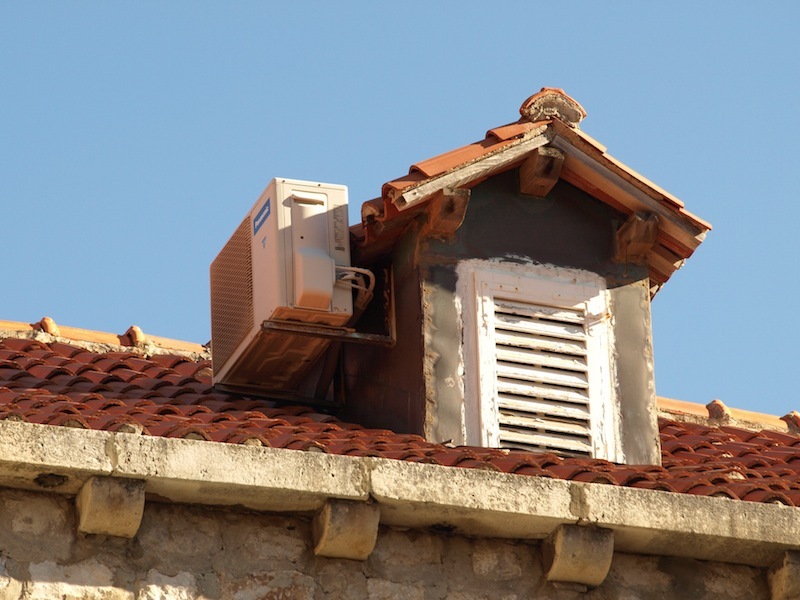 A roof with as many intrusions as this would surely leak. Looking up can have drawbacks. Amazingly, dog owners who live within the old town let their dogs crap on the footpaths and they don’t pick it up and, you guessed it, I walked into a nice fresh one! 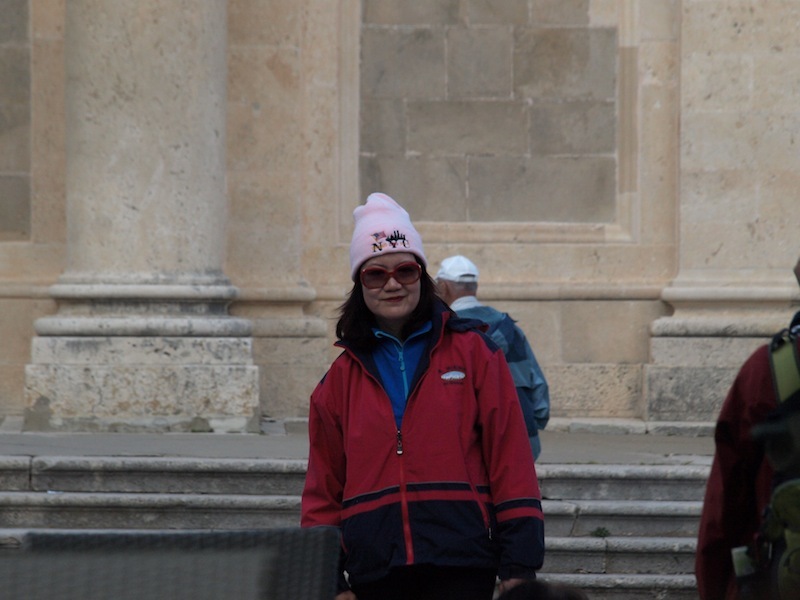 Dubrovnik is a world heritage listed area and because tens of thousands of people visit it each year you would think the dog doo problem would be solved in the interests of the tourists. Another surprising thing is there was a lot of rubbish in the form of polystyrene bits, plastic bottles and packaging nudging the steps and walls near where people were sitting drinking and eating. One local stallholder dropped a piece of paper which I picked up and gave back to him. He immediately threw it into the water. 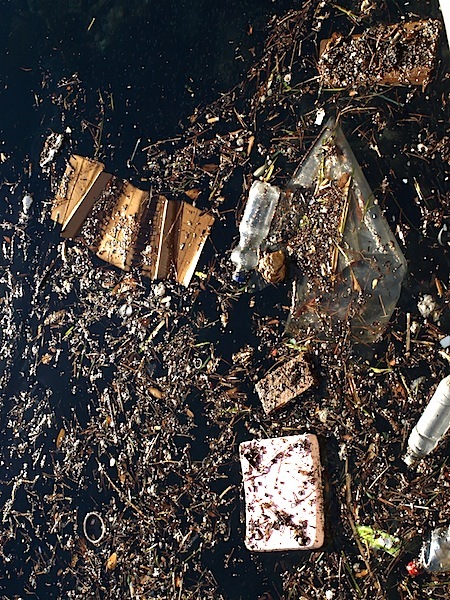 Rubbish and seaweed floating in the marina adjacent to the main tourist haunts. Personally, I think the people in the employ of the government who are in charge of the museums, drive the buses and those who administer the city are tired of the tens of thousands of tourists who visit each year. I reckon the people of Dubrovnik need a tourist free day once a week so they can have their city back, breathe and look at what is going on around them. Mass tourism like we saw today may fill some people’s pockets with euros but for the environment and culture of a region it’s a disaster. A few of the tourists. I spoke to this man’s wife who said they were from New York. This New Yorker just couldn’t stand the pressure. 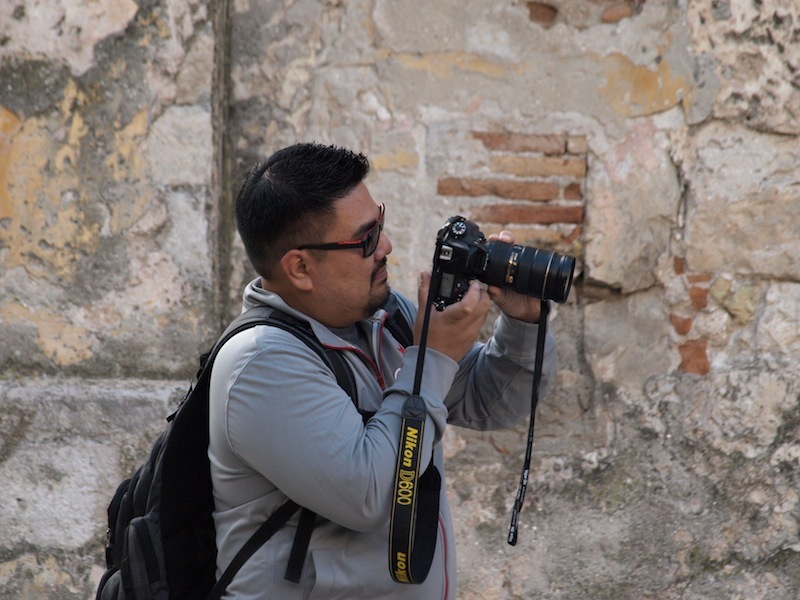 I think I know this tourist. Today we had soup in an open-air café near St Ignatius Church. It came over cloudy and the owner came out with a blanket. After our walk around old Dubrovnik city we decided to walk the four kilometres back to the studio. We didn’t want another morning bus experience. The walk, although steep and up and down, was interesting as we discovered a few things the typical tourist would never see. Cliff edge walk on the way back to our studio. There was a tall fence along one section of the walk and attached to the fence were hundreds of locks. 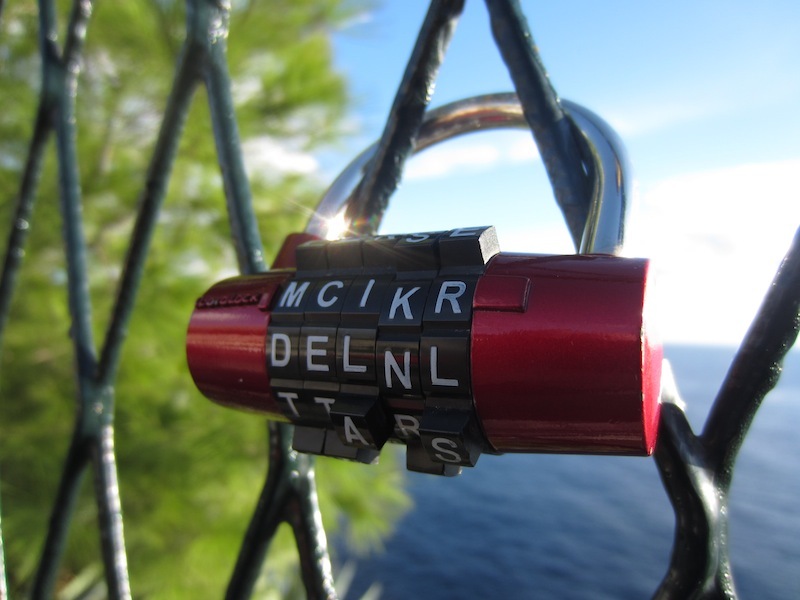 Each lock had peoples’ names engraved on them. I thought this activity a very good business for the local locksmith. 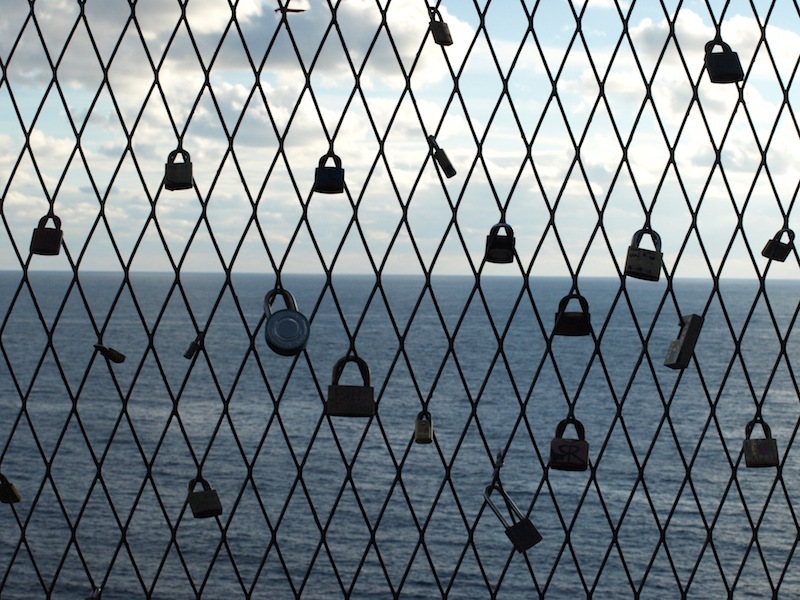 If any readers knows exactly what these locks represent I would be pleased if you could let me know. Who are you, Nikolina and Mateo? Beautiful names and lettering style. Near lock fence we passed what appeared to be a private garden. On the gate a sign said Visitors Welcome so in we went. 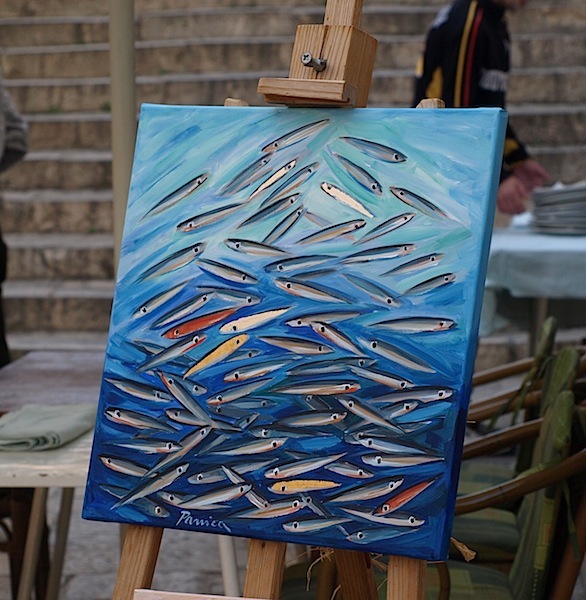 It belongs to the University of Dubrovnik. For me, it was like entering heaven, as around the periphery of the garden was every known column. 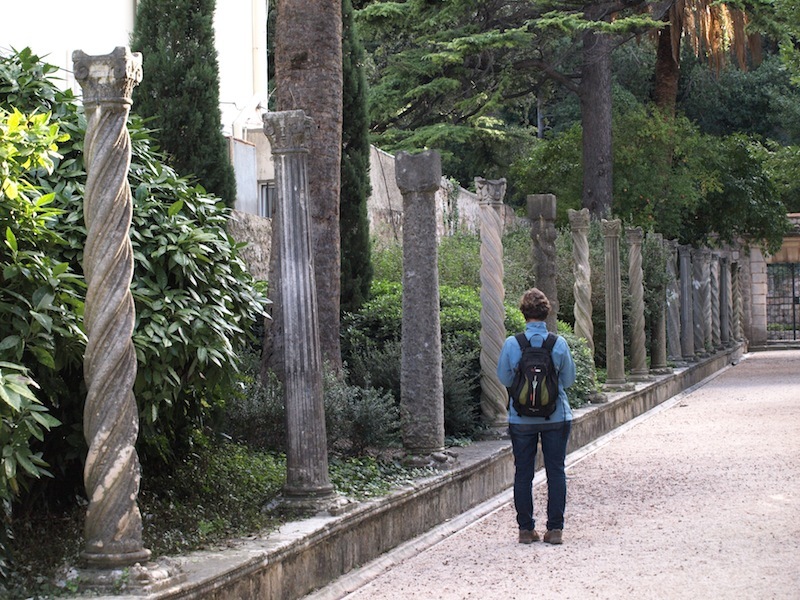 If you have been reading this blog in its entirety you will know I’m hooked on columns, especially ones in blue jackets. Around the garden edge was every known column, including my favourite. 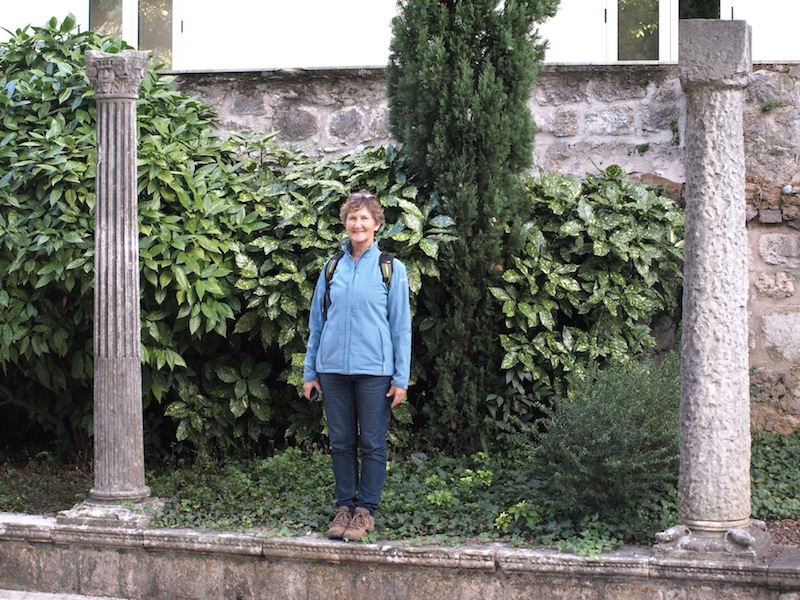 If friend Steve can pretend to be a column at Ephesus then so can Bev in this garden! 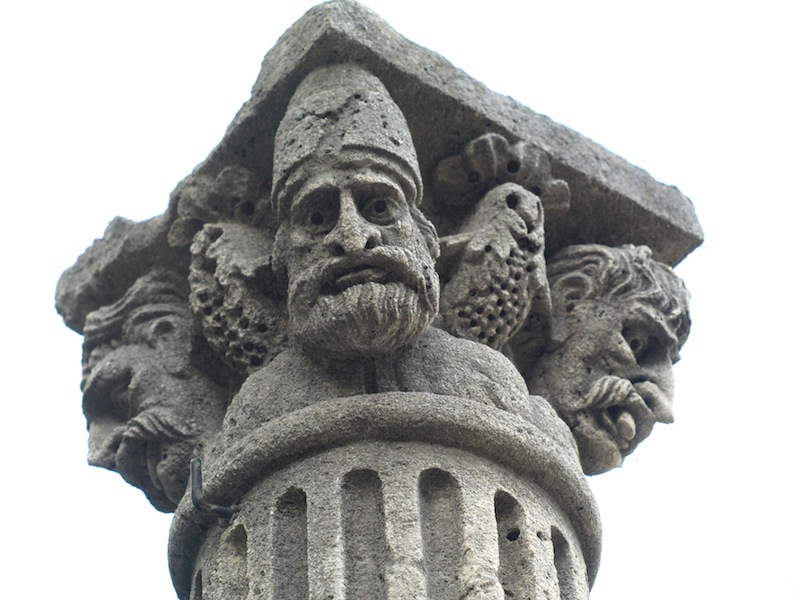 A few of the eighty columns around the garden. Columns like this are not necessarily broken. 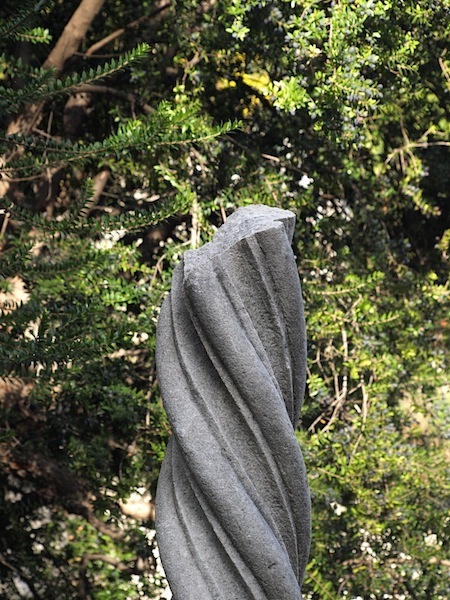 In cemeteries, broken columns on a grave do not mean they have been vandalised, it indicates that the person died young (taken before life was finished). There was one last highlight for the day. 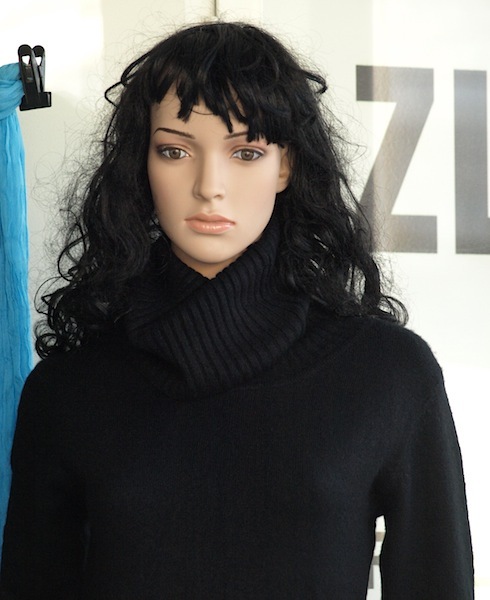 We met Sally, a like-minded traveller from the US. Sally’s room was also blacked out so she came to our room to eat. We shared food and a beer and over dinner we discussed the implications with regards travelling across the US. One of the things on my ‘bucket list’ is the purchase of a car to drive the back roads and meet ordinary people. Tomorrow we head for Mostar, another of our favourite places from 1972. Bev how do you not buy all the pretty things? Xavie likes the waves, the big boat and the little boats. It was fate that we met in the dark during power outage at the studio apt. I think the locks on a metal chain linked fence is a marketing ploy from the lock salespeople: buy a lock make a wish, throw away the key. Extra charges are made for engraving (names, date, & short message). A gesture to love declaration, or a closure, is performed on special occasions. I have seen locks on cables in the touristy section @ the Great Wall of China. I saw many locks, a bridge full, on a railway bridge in Cologne, De next to the big cathedra. I’ll email u pics as I don’t know how to post pics here. The locks decorate the fence improve the “look”. Let me know ur visit to USA, I can help u plan.